Random | Laughing is required. A few times a year my friends and I travel to the home of our alma mater to catch a game and visit our favorite establishments. Of course, we have been out of college for several years so we still call the bars by the names they had five owners ago. We know that we are the old people in the bar but we don’t care. I am also out of touch with any scene that does not involve children’s toys or programming. For example, my sister-in-law and I visited the ladies room at one of the bars and it smelled awful. “Why does it smell like skunk in here?” I asked. “Ha ha! That’s not skunk! That’s marijuana,” she said. “I told you,” my sister-in-law said, laughing again. After we had left the bar, my sister-in-law was telling the skunk story to the guys. Crossing the street with us was a group of college students. The college students next to us started cracking up. They probably had not heard people refer to the drug as marijuana for a while. “Oh no! Not marijuana!” one of the guys yelled in jest. The hubs just shook his head. “We’re old,” he said. Our final stop of the night was Cozy Inn where they sell mini hamburgers topped with onion, pickle, mustard and ketchup. It was almost 2 a.m. and there were only six of us left, the other six had made their way back to a hotel. While we were waiting for our order, two couples entered. Both of the women looked like younger versions of a mix between Aretha Franklin and Kathy Kinney from the “Drew Carey Show.” The four were chatty, as were my friends. Before long we learned that the women were (amateur karaoke) singers. They invited us to watch them perform at Kites, a local bar, any “Monday, Tuesday, Wednesday or Thursday.” They said the days of the week in sync while counting from one to four with their right hand. They were pros. We gave them a standing ovation, and my friend gave the lead singer a $10 bill, which she placed in her bosom right next to her phone and her I.D. I had a meeting scheduled this morning for work. It would have been our first meeting so I took a seat at Panera and kept an eye out for someone who resembled the LinkedIn photo I had pulled up on my phone. Five minutes passed. Then ten. I looked at the guy sitting at a table by himself. No match. I took a second trip through the restaurant. No match. I saw a guy lingering near the front of Panera. Maybe if the guy I’m meeting gained some weight and grew his hair out, maybe that could be him, I thought. “Are you Leo?” I asked. “That’s hard,” said a second guy from another table that had been watching and listening. How do I respond to that? “So much for Neil,” he said. I went to the front to put in a to-go order for me and the hubs. By the time I turned to return to my table Steven was gone. I gathered my things and as I was walking out the other guy who had piped in earlier, piped in again. “Have a good day,” he said. I found this sweet face at an animal shelter. Her name is Prune and she is only two months old. But after a lot of thought about how Prune likes to chew on everything and needs to be potty trained, I realized I already have one at home who likes to chew and needs to be potty trained. We may not be able to give Prune the attention she deserves, but if you can she is waiting for you at the Great Plains SPCA. 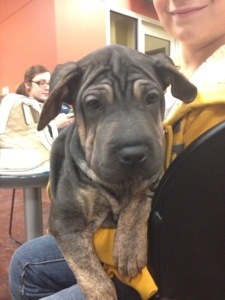 She is a shar pei/plott hound mix and has a laid back personality. Aww, sweet Prune. Still thinking of you. Today I started a new chapter in my career. I left the business development team at a law firm to take a fundraising role at a charity. As for the charity, well, I have been on its board for five years and I consider the staff my extended family. My first day at the new job didn’t feel like work. It felt like home. Yesterday I was operating like it was a typical Sunday. I helped the 7-year-old with his homework, and filled out the parent survey and wrote a check for the toddler’s daycare fees. It wasn’t until later on in the evening that I remembered this is a three-day weekend for everyone except the hubs. So, I let the 7-year-old stay up later than usual and the hubs and I agreed to meet on the couch at 11 p.m. to catch up on the shows we had recorded. I noticed that it was getting colder in the house. I wrapped myself in a blanket and took my place on the couch. The hubs silently walked upstairs, then downstairs, then upstairs, then outside, and back downstairs again. “What are you doing?” I asked. “The furnace is out,” he said. He came back down and grabbed a blanket of his own. The new “Modern Family” episode was worth the wait. We were 12 minutes into “Grey’s Anatomy” when the fire alarm went off. Before I could even look over at the hubs he was already up a flight of stairs. I jumped up and followed. I didn’t smell or see any smoke. We unplugged the space heaters. The hubs had to unplug three smoke detectors and remove the batteries to get them to stop beeping. The boys slept through the whole thing. We placed an extra blanket on each kid and returned to our DVR party. It was 11:52 p.m. We finished the Grey’s episode and the “The Office” when we decided to call it a night. It was almost 1 a.m. As we were crawling under our electric blanket, it happened again. Beep! Beep! Beep! Beep! “It’s OK, shhh, don’t cry,” I said as I rubbed his back. The alarm stopped. Then…Beep! Beep! Beep! I could hear the hubs getting angry. He yanked the alarms back down again. Ahhh. Quiet. “All gone,” the toddler said. “My want Daya!” he started to cry again. I went to find the hubs. I stopped by the 7-year-old’s room. He was still asleep. The hubs went into the toddler’s room. I took him a sweatshirt before climbing back under the electric blanket. My nose and fingers were freezing cold. The heat from the blanket helped my muscles relaxed. I closed my eyes and enjoyed the warmth. Beep! Beep! Beep! Beep! Beep! Not again! I looked at the clock. It was 1:34 a.m. I stopped by the 7-year-old’s room. Still asleep. I went into the toddler’s room and he was wide awake. I stayed with him as the hubs yanked the alarms out again. This time the toddler was scared and the dog’s nerves were shot. The dog was shaking and whining at my feet. The toddler wanted me to stay so we camped out on his floor. He eventually fell asleep. I woke up periodically throughout the night to make sure he was covered. My thoughts were still with the electric blanket that was now keeping the hubs warm. At 6:30 a.m. I went back to my room. The hubs’ alarm clock was going off. I couldn’t take another alarm. “Please turn it off. No more alarms.” A couple of rounds of snoozing the alarm and the hubs was up and off to work. I fell back to sleep. It seemed like minutes but it was two hours later when I heard the garage open and the hubs run up the stairs. He was fiddling with something before I heard…Beep! Beep! “What’s going on? !” I asked. The 7-year-old came shuffling into our room, wrapped in the blanket that we had added to his bed last night. “What in the world? Why is it so cold in here?” I caught him up on the latest. We flipped on “Scooby Doo” and snuggled under the electric blanket. 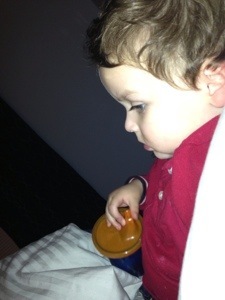 The toddler woke up and joined us in bed, too. I don’t get many snuggles from my boys so this was the best morning I’ve had in a long time. The furnace has since been fixed and the house is warming up from its 55 degree low. I made pizza for lunch and found myself lingering in front of the warm oven. As of now, the smoke detectors are still unplugged. They don’t seem to care when I glare at them. I’m sure everyone will turn in early tonight. I hope he house sleeps, too. Today is the first snow day of 2nd grade. I loved snow days as a kid. They were awesome! I remember thinking, “Ha, ha, teachers! We don’t have to show up today.” But now that my friends are teachers, I get the picture from their news feeds that they are just as happy to not be there. So everyone is happy to not be at school? That doesn’t feel right. I counted up the number of days my son is in class — not counting snow days. It equals about six months (not including weekends). That doesn’t feel right either. I’ve heard some school districts discuss adding hours to the school day. Others have discussed extending the school calendar. I may be the most unpopular mom, but I’m all for extending the time that my son spends in class, whether that is more time each day or a longer school year. The average elementary teacher salary in my school district is $45,500. To ensure that teachers are treated fairly, perhaps we should evaluate how much they make per school day and increase their pay to reflect the additional teaching time. This is a discussion worth having. Five days after the Newtown tragedy and I am still finding it difficult to come up with posts for my blog, which is supposed to be funny or random or really anything other than broken-hearted sadness. I no longer take one more day with my friends and family for granted. I know how very lucky I am to be able to love and to be loved another day. Any story I can think of to share with you is insignificant, but I’ll give it a go with a story about luck. I find money. Not a lot of money, mostly coins. Pennies, quarters, dimes, I find them often. I told the hubs that I find money and he just kind of smirked as if he didn’t believe me. I’ve even found money in front of him and that’s the reaction I got. He must not be counting how many times this has happened because it’s more often than stumbling upon a penny every few months. For example, one day I found five coins and each coin was found separately during different times of the day. I’ve decided that since I’m so short, I’m closer to the ground and I notice shiny things more easily. That’s my theory. Well, one day after work I was walking to my car and I saw something gold on the ground. I almost didn’t pick it up because I thought it looked like a car wash token, but it was so shiny. Shiny like a plastic gold piece that would belong to my son’s pirate LEGO set. It was too big to belong to a LEGO set, though. I bent down to pick up. I didn’t recognize the coin so I put it in my pocket and decided to ask my all-knowing husband. When he got home I showed him the coin. He couldn’t identify it either so he turned to Google. Turns out I found a gold Liberty $2.5 coin valued at no less than $300. My husband believes my metal detecting powers now, but it took a rare find. What about your luck, you ask? Well apparently Kansas City’s residents have holes in their pockets. Check out Natasha’s blog: http://myhairisbetterthanyours.blogspot.com/2012/12/big-money.html. Keep your eyes peeled to the pavement, KC! Around lunch time today, my coworker and I went on short walk to the library and to Planet Sub. We were exchanging small talk and enjoying the 70 degree weather (what winter?). As we were crossing the street, I noticed a man ahead of us ranting to anyone who would listen. I wasn’t sure what he was talking about, and I was OK with keeping to myself. I kept my gaze down. Then he started walking alongside me and my coworker. He looked at me, waiting for an answer. I was having the internal debate of whether to answer him because it was the human thing to do, or to ignore him because who knows what answering him might lead to. “Yeah! That’s what I’m saying,” he agreed with excitement. “Don’t wear something that says one thing and then act the opposite. Women should dress more like you.” He motioned to our outfits, the standard office uniform of black slacks and blouses. “You women are classy. High five to keeping it classy!” He reached out and gave us both a high-five. Then he laughed and went on his way. High-five to keeping it classy. I have zero tattoos, but I like them. I really do. I appreciate well-executed tattoos that are works of art. 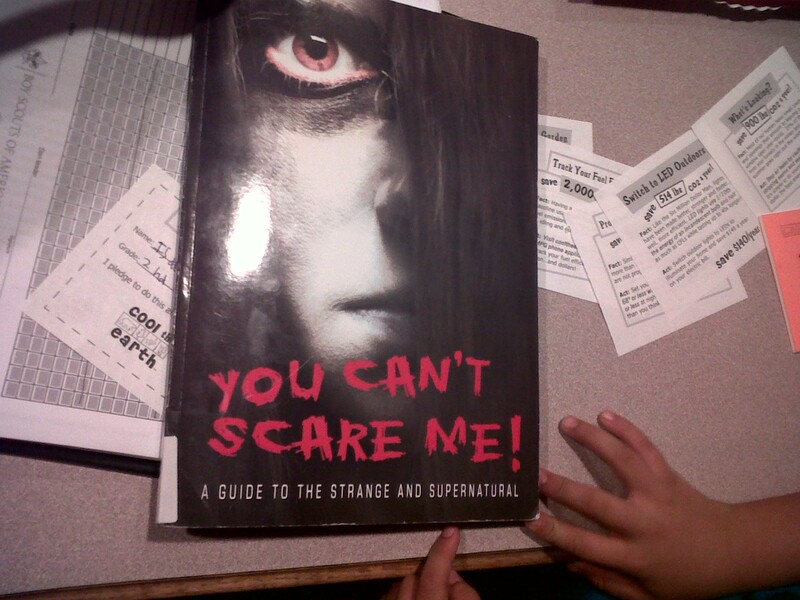 My son came home from school with a super scary library book. I don’t mind a good scare every now and then, but one evening, several years ago, the scare was all too real. It was 1995 and I was in high school. My bedroom was in the basement and my parents were two floors up. I was pretty tired that evening and I easily drifted to sleep. Around 11:30 p.m. I heard a few steps creak. It sounded like someone was coming downstairs but was trying to step lightly. My bedroom was at the bottom of the stairs. I assumed it was my mom coming downstairs to check on me. I rolled over so she would think I was asleep. I could hear my bedroom door slowly open. I kept my eyes closed, pretending to sleep, waiting for her to go back upstairs — satisfied that I was in bed. Instead, I felt her sit down on my bed, her back touching the lower part of my back. I thought, She wants to talk. I’m too tired to talk. I just want to sleep. I waited. But she didn’t say anything. I waited some more. My tired, grumpy self said, “Mom! What do you want?” Silence. “Mom!” More silence. It wasn’t my mom. My back started to break out in a sweat. I could still feel her (someone? something?) leaning against me. I was too scared to open my eyes. I laid completely still trying to wish the person away. After what seemed like an eternity, the presence either stood up or disappeared. I was still too scared to look around my room. I kept my eyes closed and listened for the footsteps to go back up the stairs. There were no more footsteps. I eventually drifted off to sleep. The next morning I looked around my room. Everything was in place. My bedroom door was open just a crack.